The name Monjuuic comes from old catalan Jew Hill , many cities in Catalona have their Monjuic. Naturally wooded, the slopes of the Montjuïc were traditionally used to grow food and graze animals by the people of the old centre of Barcelona In the 1890s, the forests were partially cleared, opening space for parklands. The site was selected to host the 1929 World fair, for which the first large-scale construction on the hill began. The surviving buildings from this effort include the grand Palau Nacional, the Estadi Olímpic (the Olympic stadium), the Magical fountains, and a grand staircase past the Font Màgica, the Magic Fountain and The Poble Espanyol, a “Spanish village” of different buildings built in different styles of Spanish architecture, also survives, the Pavillon Mies van der Rohe was constructed at the foot of the hill. Also completed in 1929, the Olympic stadium was intended to host an anti-facist alternative Olympics in 1936, in opposition to the 1936 Berlin Olympics . These plans were cancelled due to the outbreak of the spanish civil war. The stadium served as the home for spanish football team. The roads in the slopes facing the city were once the Montjuic circuit Formula One racing, hosting the Spanish Grand Prix on four occasions. However, a terrible accident in the 1975 race saw a car crash into the stands, killing four people; as a result the Spanish Grand Prix never returned to Montjuïc circuit. The ornate Palau Nacional houses the Museu Nacional d’art de Catalunya, an extensive showcase of Catalan painting and sculpture. The famous painter Miro decideed to collaborate to the building of his museum. His paintings are then much better exposed. 2012 Big event in the Monjuic hill the Piknic Electronik from a concept from Montreal. 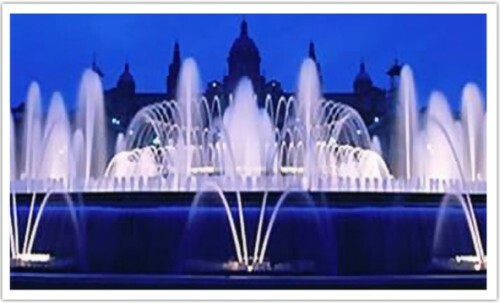 It is possible to hire an apartment near the Monjuic hill, and the Plaza Espana .